Grapevine has a couple types of Bible Studies available. One is a Multilevel program, which has one teacher book and one student book, and everyone in the family can use that together. There are also studies which are broken down into six levels. Levels 1-4 are intended to coordinate, so you can teach kids from roughly age 6 though teens together. The Beginner Level does not coordinate with the older levels, but if you only have PreK-K kids (or probably even a bit older! ), this would work for them. Level 5 is a self-directed study intended for older teens and adults. Basically, after the whirlwind tour of the Old Testament, you start over at the beginning. In the overview, you "stick figure" about 45 people or events, as a chronological retelling of the Bible. 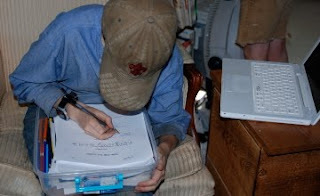 Then, in the meat of the study, you go back and go over the details of those 45 timeline entries. You are covering the same stories in levels 1-4, you just add more to it as you get to the higher levels. Level 1 hears the story, draws some stick figures, and works on memorizing a Bible verse. Level 2 does all that, plus learns some other Bible facts (books of the Bible, names of the tribes of Israel, the 10 Commandments, etc.). Level 3 adds some geography, with mapping assignments that give you a feel for the where behind all these stick figures. And Level 4 adds a layer of research, using reference materials including a Topical Bible, a concordance, and a Bible dictionary. Essentially, the kids are doing one page in their workbook each day, with only a few exceptions. I'll assume we start on a Monday. Monday: Connor (Level 4) spends his day in research. He is looking for information about rainbows in the Topical Bible, figuring out what Tower of Babel is in the dictionary, and finding the first reference to language in the Bible in the concordance. His Quest Question is When God gives a command, what options do we have? I generally end up getting my younger kids started, and I sit with Connor, so we can really discuss what he is finding. It is fascinating to hear what he comes up with with these questions. Tuesday: is a review day, setting the stage for this lesson. 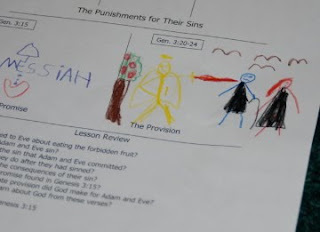 All levels do a "big picture" timeline (using stick figures) of the previous three lessons -- in this case, Adam and Eve, The Fall, Noah and The Flood. We also all review the previous three lessons worth of Bible memory work -- in this case, Genesis 6:8, Genesis 3:15, and Genesis 2:7. This is the shortest day of each study -- we usually spend about 15 minutes. And my 3 year old is even memorizing many of the verses, so I'm listening to five kids recite those. Wednesday: I start by reading the Bible aloud. We'll be working through Genesis 8-11 between today and tomorrow, so today, I read Genesis 8 and 9. Then we go through four scenes, reading a couple verses per event, looking up words in the Bible dictionary for most of them, and drawing a stick figure representation. The third event, to give a specific example, is Genesis 9:8-11, where God promises not to flood the entire earth again. We look up covenant and descendants, and we draw a worldwide flood with the circle and slash used in modern signs to tell you something isn't allowed. 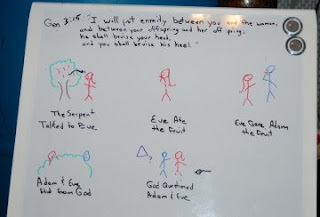 We also start reviewing the Bible verse for this lesson (I write it on the whiteboard) which is Genesis 11:9. And Thomas (plus his brothers, since they can stand the practice!) is working on memorizing the Books of the Law (Genesis, Exodus, Leviticus, Numbers, Deuteronomy). Thursday: very similar to Wednesday. We continue by reading Genesis 10-11, and working through another four events, again looking up words in the Bible dictionary for most of them. The fourth event is Genesis 11:8-9 where the people are scattered. For this, we look up Babel in the dictionary, and William (Level 3) pulls out his first map to locate Babel. The stick figure representation is a circle labeled Babel, with four smaller circles going out from it, representing the people being scattered. There are also 7 lesson review questions which we cover orally. These are the who, what, when, where, why and how questions... Where did the ark land? What promise did God make to man and all living creatures? When did the people scatter? Again, we work on the memory work. Friday: in this case, this is the last lesson for the unit, so there is a review. I'll pretend that doesn't exist for my description here, and go to the follow-up that happens after the unit review (which is what normally comes as the last day of a lesson). The Level 2-3 students add information to the card they had created for The Flood -- talking about God's promise and the rainbow. And they create a new card for The Tower of Babel, with information on it, condensed here, that -- God told Noah to scatter and fill the earth, the people gathered together in Babel, they built a tower, and God confused their language causing the people to scatter. Level 4 starts working on the reference materials for Job (the next lesson -- see my description above for Monday to see the types of things he would be working on). I don't know if that is clear to anyone but me! Basically, though, with each lesson (which takes four days) you are reviewing what you have been learning for about the past three weeks, getting fairly in-depth with a new event/person of the Bible, learning a new verse, and adding to the timeline. It is fairly predictable, once you get going, which means it doesn't take a ton of prep time for Mom, and the kids have a good idea as to what to expect. Connor, just to illustrate how differently kids will look at the stick figuring, loves to pretty much copy mine exactly, and he wants to be sure to understand all the symbolism in each figure. He thinks in terms of "what is the bare minimum I can draw and still be able to recall the story?" I'm sure it is both an age thing and a personality thing. Prep time: I'll admit that I am not spending as much time preparing for the study as I ought to, but we have studied Genesis SO MUCH that I just can't bring myself to do a lot just yet. Mostly, right now, I pull up the teacher book and read through the materials (5-10 minutes for the entire 4 days of lessons), and I pull up Logos and do the Level 4 research (usually about 5 minutes). I also type up the memory verse, and get it written on the white board ahead of time. And I pray about the upcoming study, that my kids will learn in spite of me, that I will know what to emphasize, that we will all grow through our study. Right now, I'm spending maybe 20 minutes per "lesson." Once we get out of Genesis, I will also read the Bible readings ahead of time. Especially as we get further -- like the lesson on The Judges, which covers Joshua 24 through Judges 21. I may alter our plans once we get that far, to be doing one lesson each week, so I can have the weekend to do my preparation, and we can then do the lesson over five days instead of four. That gives me a bit more time to do more reading with the kids too. My kids are already asking if we can do the New Testament Overview next year. I told them that I hope so. We may need to adapt it a bit, maybe purchasing only one student level eBook, and winging the different assignments for other ages. It is a fantastic study, and I want to continue. Ideally, I'd love to start rotating through these: Old Testament this year, New Testament in 2010/11, some other more narrow studies in 2011/12 (I'm eying Biblical Feasts, and Dianna says she is planning a book of Acts one for 2011, so I'd love to do that too), and then start over with the Old Testament. This is one of the pros of this program. I am pretty sure that we will be able to repeat this exact same study in a couple of years, with kids moving up a level and getting more out of it. And all I'll need to purchase is a Level 5 book, which Connor would be doing independently. One thing I don't like about Grapevine, though, is that if you are doing it with multiple levels, I wish there was a bit more hand-holding to help you to figure out how to integrate it. They recommend you get only the teacher book for Level 3-4 even if you are also using this with Level 2 student books -- and yes, you can teach from it. But a bit of a "here are some things that are different for the younger students" section would be immensely helpful. Also, the teacher book gives you references for the student book by page number... but that is for the Level 4 student book, not the level 3 one, which is off by a couple pages (so Connor is on page 25, but William's "same" page is #23). Other pros though -- I love that this covers the basics without getting into specific denominational doctrine, so I will be able to add that myself. I love that it is sort of scripted, so on a bad allergy day, I have something to say without having to think quite so much; yet most of the time, I can glance at the provided sentences to be sure I'm covering the main points, and then say it the way I want to. If you want to purchase anything from Grapevine, there is a coupon available to the Review Crew readers (that's YOU!) for 30% off. Enter coupon code: crews anytime between now and September 15. Pricing: The materials I received include the Old Testament Overview Levels 3-4 Teacher ebook ($24.95), the Level 2 Student eBook ($25.95), and the Levels 3 and 4 Student eBooks ($28.95 each). There are physical books available too. For the record, I chose to use the teacher book straight from my laptop, and only printed the student books. That's one advantage of getting eBook format for the student books -- you can print it out for each child as you go through. To do the study, the kids will also need colored pencils, and to do it as written, you will need a white board and 8 colors of dry-erase markers. We did a couple of lessons with me showing them the stick figures in the teacher book, and we also did a couple with me drawing the stick figures with colored pencils in a notebook. I do really prefer the white board. You also need a Bible dictionary, which you can find online if you don't own an actual book already. If you want to try it out, sign up for her newsletter. Over the summer anyway, she is sending out free lessons you can try. Keep in mind that the students are meant to do one page a day in most of the studies, as I had a hard time figuring out the pacing with some of these. Past freebies are available for a low price ($3) if there is one that grabs you. These would be a good way to try the program out. I really appreciate the flexibility. In the back of the teacher book, there are schedules for a weekly Bible class format (51 weeks), or for a weekday study (35 weeks, 5 days a week). I have a 10yo who may have a little knowledge of some Bible stories such as Noah, Moses and maybe other smatterings of OT stories. I then have a 7yo and 4yo to teach too. Which level do you think we should start with? Should I get my 10yo to do the basics just for now as he hasn't even read his Bible on a regular basis? Jen -- you know what I'd do? I'd go to the Grapevine site and email Dianna at the 'contact us' link. She is amazing at helping you to figure out what to use. But my opinion? I'd go with an easier level than you necessarily would just going by age/grade. Unless your 10yo is very into maps (that was my deciding factor for William-- he loves maps, so I got him level 3). I would think that you could go a couple different ways. Get Level 2 (meant for ages 8-10) and adapt that for everyone (the difference between Level 1 and Level 2 is just that Level 1 doesn't memorize the extra stuff... so drop that off to make the same ebook be "right" for the 6-8 year old level). And let the 4 year old get what he gets. My 5 and 3yos are doing fairly well. Or get the OT Basics (a NT Basics is due out in the spring! ), which looks really good too. I don't know much about that one though. Or you could even get the Beginner Level, which is more of an OT (or NT) greatest hits. That is intended for ages 5-7, but I think it would work for everyone if you like that idea better. I think it's very cool that your kids are "getting it." We are doing level 1-2 New Testament Overview. I hope to get my review posted in about one week (which will be one week before deadline)!!!! I've heard of Grapevine Studies, but it was good to see the pictures of your kids actually donig it. It was hard for me to understand what it was about. I think my kids may enjoy this when they get a little older.